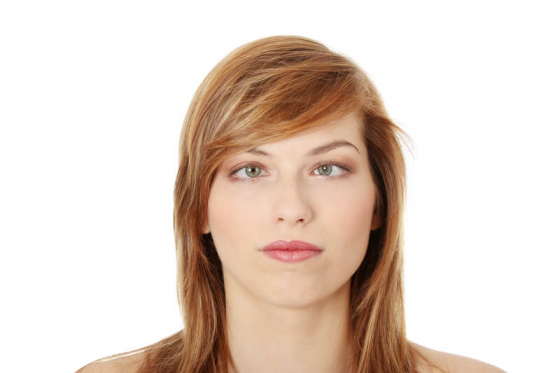 Strabismus is a condition also known as a ‘squint’ or ‘cross-eyed’ where the two eyes point different ways. One or both of the eyes may turn in, out, up or down, making it difficult for both eyes to focus on the same object. Read our article understand more about this eye condition. Strabismus is a condition also known as a ‘squint’ or ‘cross-eyed’ where the two eyes point different ways. One or both of the eyes may turn in, out, up or down, making it difficult for both eyes to focus on the same object. A minor squint may not be obvious from just looking, or sometimes the extent of the condition can be visibly pronounced. Around five percent of children will have some degree of strabismus – usually it develops quite early on, before the age of five, but can develop later. Strabismus will not get better by itself and does require treatment. Crossed eyes. If the strabismus is severe enough it will be evident just from looking at a child that has the condition. If the eyes do not align in the same direction or do not move in a co-ordinated fashion, i.e. in the same direction at the same time – they will definitely need to see their GP and an orthoptist. Double vision. If the child reports seeing two images of a single object that are mixed up or next to each other, they may have double vision. Often young children will not be able to articulate a condition like double vision, but may narrow their eyes, cover one eye, or tilt their heads when trying to focus on an object. These actions may indicate a problem. Amblyopia or ‘lazy eye’. If left untreated strabismus can lead to a lazy eye, where vision in one eye does not develop as well as the other. This is because the brain ignores signals from that eye as a way of compensating for the squint. The causes of strabismus are varied – in some cases it is present from birth and likely congenital, in other cases it may develop in the first few years of life. A squint may develop as a way of compensating for other eye conditions. Short-sightedness, long-sightedness or astigmatism can cause or exacerbate a squint, especially if the conditions are not diagnosed early. There is evidence that a familial history of strabismus makes it more likely to suffer from the condition. There are also certain illnesses or conditions that may cause a squint in childhood or adulthood - these include: cerebral palsy, congenital rubella, measles, Down Syndrome, and hydrocephalus (water on the brain). The Cornea and Lens – These are at the front of the eye and help to focus light directly onto the retina. The Retina – This is a layer of cells at the back of the eye that sense light and colour before converting them into electrical signals. Movement of the eye is controlled by six muscles called the extraocular muscles. These muscles expand and contract to pull the eye in different directions allowing it to focus on particular objects. The fovea centralis is a tiny part of the eye that allows us to process incredibly sharp and accurate vision. Therefore, the extraocular muscles are essential in moving the eye in a fast and accurate way, so the fovea can focus on particular objects. When it comes to someone with strabismus or similar eye conditions, these muscles that normally work involuntarily and in co-ordination, do not work together. Hence, one eye may move around and focus on objects perfectly normally, while the other works independently. This may be as a result of congenital problems with the nerves that send and receive messages to the brain. Strabismus is usually diagnosed during routine eye tests that take place when a child is a new-born, a few months old, or when they start school. Although these tests are very good at ruling out common eye conditions like squints, it may still be worth speaking to your GP if you notice any of the unusual symptoms that we outlined above. If there is cause for concern, the patient will be referred to an eye-care health professional who will conduct some basic tests to confirm the condition. These tests may include a ‘cover test’ where one eye is briefly covered while the patient is asked to focus on a particular object. Any unusual movement or alignment in the eyes may indicate a squint or lazy eye. Other tests may include a corneal light reflex, which is where a light is shone into the eye to observe the position of the cornea (which should be centred). A visual acuity test using a standard eye chart or one that has been customised for young children can be used to check the quality of vision in each eye. Sometimes they may also use an ophthalmoscope – a piece of equipment that allows an optometrist to see inside the eye and observe its structure and any faults. Babies usually have an eye examination at birth, or within 72 hours. Between 6 and 8 weeks old, they will have second eye examination, usually carried out by a GP as part of a routine screening programme. If you have concerns about your child’s vision, you can have their eyes tested at any time by an optometrist at an optician. Optometrists conduct eye exams and test sight, and if needed, they prescribe glasses or contact lenses. They can also recognise eye conditions and sight defects. Orthoptist - specialises in problems relating to eye movements and vision development. Ophthalmologist - a medical doctor specialising in diagnosis and treatment of eye conditions. If your child’s vision is normal, it’s important to take them for a regular eye check once every year at the opticians. These eye tests are free for all children under 16 years old, and those under 19 years in full time education. Fortunately, treatment for strabismus in children is usually very successful. Prescription glasses may be used to correct refractive errors like short-sightedness or long-sightedness, which helps the eyes see properly and corrects the squint. If the condition has developed into a lazy eye, then it would be necessary to wear an eye patch which forces the patient to use the weaker eye, strengthening it and correcting the alignment. Eye exercises may be beneficial for strabismus, they are designed to strengthen and re-align eyesight in the same way using a patch forces an eye to improve in strength. Most of the typically recommended exercises involve the repetition of focusing on different objects, such as a pencil, until the eye muscles become tired. Much like with working out any other muscles, repetition and muscle memory are key to improvement. A botulinum toxin injection may sometimes be given, usually this treatment is for adults, but can also be used with children. The toxin relaxes the muscles around the eye which can then gradually realign to the right direction. Unfortunately, there can be side effects like double vision, droopy eyelids or muscle weakness in the area of the injection. If the use of glasses, contact lenses, and eye exercises fail, surgery may be necessary. The surgery will be performed on the extraocular muscles, changing their position to ensure the muscles are balanced. Once the patient is under general anaesthetic the surgeon will either move or shorten the muscle, depending on whether they need to increase or decrease the pulling effect on the eye. The muscle will be sewn into its new position with dissolvable sutures. A follow-up procedure – sometimes the problem is not corrected with one operation and requires a second. Double vision – this may not last very long, but can be pronounced immediately following surgery. However, it is quite rare. The eye may become damaged or infected, this happens in very rare instances and is a potential complication of any surgery. Following surgery, it will take several weeks to recover, there may be some pain, but unless there are any complications you should be able to do normal things like reading, relatively quickly. For adults it may be several weeks before you can resume to things like driving or playing contact sport. You should consult with your doctor to see when it is safe to resume these activities. For young children it is not uncommon for the squint to come back and a second surgery may be needed. Sometimes the appearance of the eye will return to normal, but vision problems may persist. If the condition is allowed to develop into ‘lazy eye’ and is not treated in time, it may become permanent. Often though surgery is not needed and problems can be fixed with glasses or exercises as outlined above.